The story (which is based on the diaries of its protagonist) is set in Providence, Rhode Island, Lovecraft's hometown and a favorite locale for his fiction. The protagonist, Robert Blake—a young man with an interest in the occult—becomes fascinated by a large disused church set on Federal Hill in Providence's west—the Italian and migrant quarter—which he can see from his lodgings in Providence's Upper East side. His researches reveal that the church has a sinister history involving a cult called the Church of Starry Wisdom and is dreaded by the local inhabitants as being haunted by a primeval evil. Ok, so I might be biased in regards to this review (it even is my first one here on MAL), as I absolutely love Lovecraft and this story--The Haunter of the Dark-- was the first one I read. But alas, bear with me. Also, it can't be a fully-fledged review as these stories barely have any characterization or "meat" for that matter, but it's other things that make it great. As for the story, it's a fairly simple one. It tells the tale of Robert Blake, more specifically-- his death at the hands of his own curiosity. His wanting of knowledge of the dark eerie church that he can see from the west window of his residence makes him discover the Trapezohedron, an occult artifact with an sinister ability. Art can seem pretty generic and a bit unpolished, but it does add to the queer atmosphere of the story and definitely portrays scenes of great fright and terror effectively. 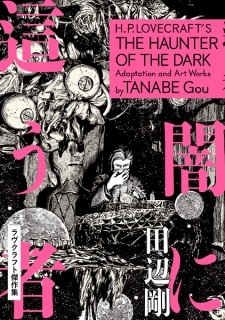 Manga art has a huge potential for this kind of stories of horror and mystery, and the author manages to grasp the essence of Lovecraft in a great way. Nothing much to talk about here, the only character is Robert Blake and his descend to insanity, which is adapted quite well from the source material. Lovecraft's monologues and hellishly long descriptions are kept to the point, so even this single character can make us quite invested in the story. It portrays the dismay and terror that Blake is feeling in great detail, while also keeping his descend to insanity a mystery that is discovered distressigly page by page. I loved it. The atmosphere is thick as hell, the descriptions are detailed and to the point, and the horror is bone-chilling. Just what I wanted from an adaptation of a H.P. Lovecraft story. I loved the short story and its abyssal atmosphere, but the manga manages to keep up with it. It certainly had the potential for a more visual representation while cutting some of the unneeded descriptions from the material. Had it been a lot more pages long, even with just no-dialogue panels of curious and otherwordly landscapes I would have given it a 10. But, it still is a great read for horror and especially Lovecraft fans. PS: There's also the short story Dagon adapted in the first chapter. It's fairly short, but it's effective at what it wants to transmit to the reader. Haven't read the original so can't really judge its adaptation.